The highest bid will buy her. Make and HP of engine: Volvo-Penta MD3B Diesel, 36 H.P. French built, steel hulled sailing yacht with tiller. Proven trans-oceanic cruiser. Sturdily built yacht. Serious world cruiser. The sailboat ATOL is a custom, “one-off,” homebuilt steel cutter with a flat sheer and a flush deck. 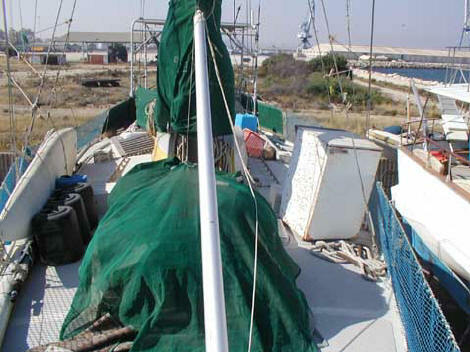 Her hull is double chine with ample beam and almost plumb vertical topsides amidships. She has a wide, nearly vertical transom and a somewhat long, narrow, straight-stemmed bow with ample overhang. The vessel was designed as a cruising yacht with a low wetted surface and somewhat streamlined appearance for reasons of performance. Her interior layout is well arranged and suitable for a family or four to five people, with sleeping quarters for seven. 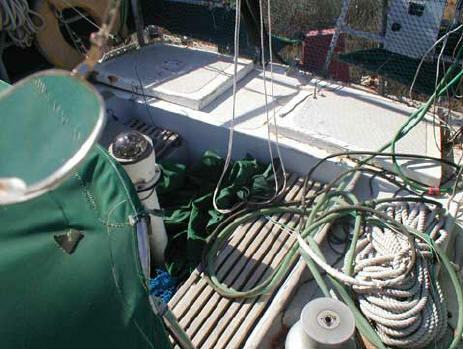 Starting forward is a small watertight bulkhead high in the bow, followed by sail storage locker in the forepeak. 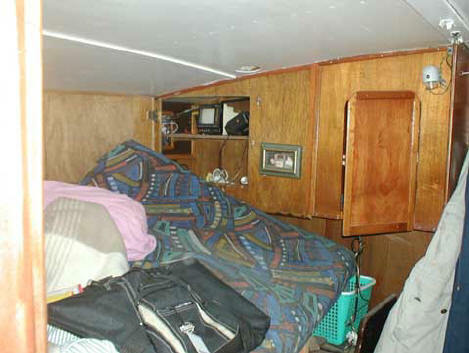 Aft of the fo’c’s’le cabin with two narrow single berths on each side. 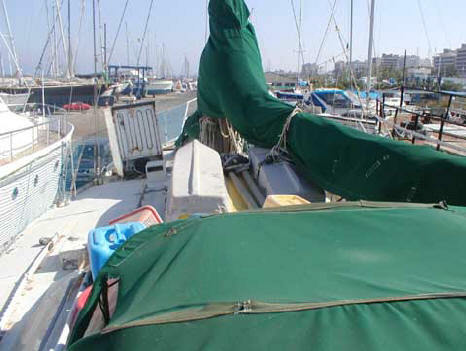 At the forward end of the fo’c’s’le berths is a chain locker from which the chain feeds though a plastic (PVC) chute to a location below bunk level. Aft of the fo’c’s’le is a head to port and lockers to starboard, followed by a stateroom with adjoining double berths. Aft of this stateroom is a large salon to port across from the galley to starboard. 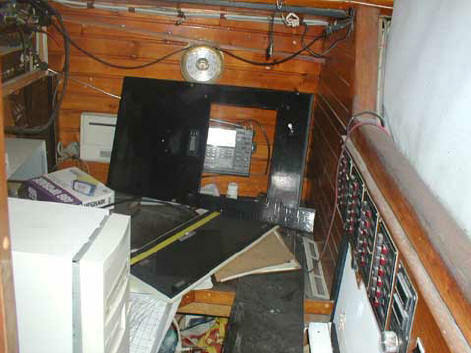 The engine, located in the center of the boat, is enclosed in a box under the salon table. 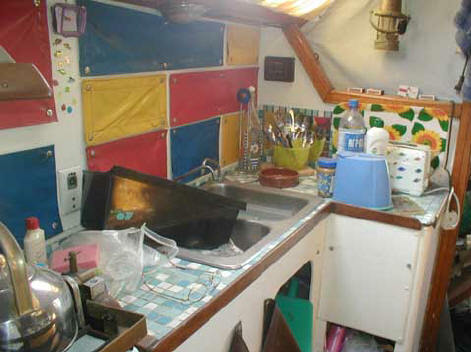 Aft of this is a large navigation table and storage extending under the cockpit to port with a quarter berth on the starboard side. 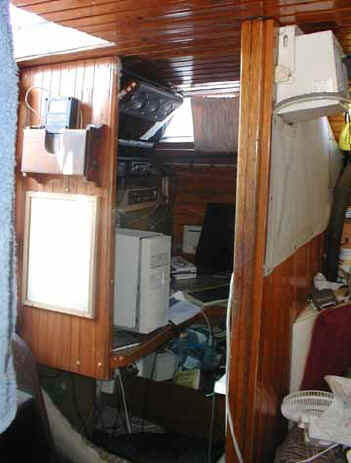 The companionway rises between theses two areas up to the cockpit. There is no bridge deck but drop boards are supplied. The cockpit is of fair size with a binnacle in the center. A small stern deck follows the cockpit with access to the lazarette. Hull constructed from ~3/16 mild steel with thicker keel plates. desirable project for the right person. Someone who didn't know what they were doing has welded a steel plate on the starboard side, this needs to be replaced. The highest bid bought her.